Aristel is a diversified Telecommunications company, focused on improving the world of Communications. Our philosophy revolves around creating innovative quality Telephone handsets and systems that deliver superior communication in terms of clarity, ease of use and functionality. Since 1993 we’ve been developing, manufacturing and supplying some of the most technologically advanced products and solutions. 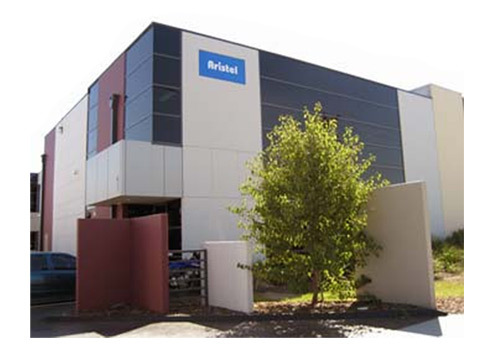 To date Aristel telephone systems can be found in over 400 dealers throughout Australia and in more than 40 countries around the world. We have a comprehensive range of devices for every type of operation from Desk Handsets, Roam Around and Long Range Cordless Phones, all designed to deliver reliable, crystal clear, cost effective connections that keep your business seamlessly connected and talking. Our user friendly telephone systems come with an impressive array of features too; including Voicemail, Paging, Fax-Link, Pre Pickup ID screening, Hands free, Conference call, call light indicators plus a whole host of useful and easy to use functions. Link Aristel systems to security door speaker stations and door phones to communicate from any location on or off premises, remotely open and close door latches from any location by push button on your handset or via secure mobile phone SMS coded instruction. Connect to Modems, Fire Security Systems, Security Alarm Frameworks and more. You will find that your Aristel PBX system is orientated for integration across a wider range of applications than just telephoning; literally elevating your business communications to a whole new dimension. At Aristel we cater for all businesses whether small, medium or large, tailoring your business communications needs. Our systems and frameworks can be added too and expanded upon with additional phones, features and functions as operations develop and grow. We future proof our PBX systems and products so you can easily link in future products with current systems without the need for any major overhauls to your existing Aristel infrastructure. We invite you to take a browse through our great range of communications products and see how Aristel can get your business better connected today! Every Aristel system is fully covered by our one year all component warranty, supported by the Aristel Manufacturing and Worldwide distribution network.